Whether you are new to martial arts or want to expand your experience, Cuong Nhu offers training at a pace that’s right for you. Students in our adult classes range from teens to retirees, all with the common goal of learning, fitness, self-defense, and friendship. With over 30 years serving intown Atlanta, we have grown an impressive teaching staff of more than a dozen black belt instructors who are giving back to our community with their volunteer efforts. If you’re looking for a traditional martial arts experience – self-defense, coordination, inner strength, control, and respect – combined with fitness, fun, and friendship, Cuong Nhu delivers that and more. By more, we mean that we throw a good party now and then, too! 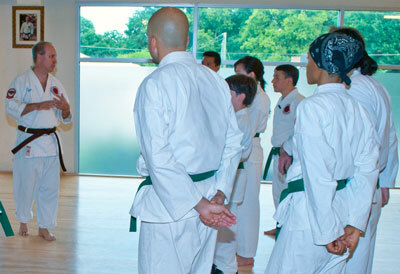 Your classes begin with Cuong Nhu’s traditional karate roots. You’ll learn basic techniques of straight-line defense and counter-attack: block, punch, kick, chop. We emphasize precision, focus (speed plus power), efficiency, control, and a non-defeatist attitude. Along the way, you’ll gain strength, stamina, coordination, balance, and an overall greater sense of self. Cuong Nhu is a mixed martial art, combining skills from Shotokan karate, judo, aikido, Wing Chun, Vovinam, boxing, and tai chi. Once you have acquired basic karate skills, your classes will blend these other techniques, opening new options for defense. Over time, the variety of your training increases by working out on the mats, practicing your techniques on the heavy bags, sparring with partners, and learning traditional martial arts weapons. For example, you can learn tambo (short stick), bo (long staff), spear, sai, sword, and more. Our philosophy emphasizes awareness and avoidance of conflict. We leave our egos at the door and welcome all students with an open mind, open heart, and open arms. Drop by during class hours for a visit and a dojo tour. We’ll be glad to meet you. Beginners may also come to Kata Class on Saturdays 11:30am – 12:30pm after a few weeks of instruction. For more information e-mail sungmingshu@gmail.com or call (404) 525-4707.